Add A Whole New Level Of Professionalism To Your Products! Do you have audio products, teleseminars or any other kind of audio that just doesn't sound all that professional? Do you have ideas for audio products but want to make sure that your tracks have opening and closing music to let people know you're a pro? Have you always wondered where to look for professional quality music that you can use in your digital products? If you answered yes to any of these questions, I have something very important to share with you today. Premium Audio Tracks To Give Your Audio Projects That Professional Hollywood Feel! If you're at this webpage, there's no doubt that you already have an audio product or are considering creating one. This is an incredible opportunity for you! Audio products have proven to be much more profitable than a digital eBook product because they offer such a personal education experience. Instead of reading a boring book, manual or course, the user can actively listen and really "get into" the product. This also makes learning easier as they can listen to it while they work in their headphones or while they write notes as they listen. Frankly, you shouldn't even be considering creating any text based product because audio will ALWAYS outsell the text based product. I don't make the rules. This has been tested and audio has proven to be AT LEAST 3 times more profitable than text. If that isn't enough to get your blood running and decide audio is for you then you might want to pinch yourself! Products That Many "Would Be"
I'm not talking about full songs or anything like that. What I'm referring to is opening and closing tracks that let people know they are dealing with a professional business. These are the same type of tracks you hear on audio products such as Personal Power by Anthony Robbins or Plimseur Language Learning CD's. The last thing that you want is for a customer or POTENTIAL customer to hear is an audio on your website or in your product that sounds like you recorded it in your bedroom. Don't get me wrong, you CAN record your audio at home just as I do but you MUST have the opening and closing tracks to add that professional, Hollywood flare to your audio projects. How Can I Possibly Get My Hands On Hollywood Quality Music For My Audio Tracks? Already created audio that you just take and use any way that you see fit. No music creation required at all! Super fast implementation. Just take any one of the audio tracks and put it into your product and you will instantly have a professional audio! Professional production by a REAL musician that makes the audio not only sound great but also sound crisp, clean and truly ear catching! Save mega bucks versus having to work with a professional musician who is bound to charge you thousands of dollars just to create you a few music tracks! This is just a sampling of the incredible benefits you get from using the 101 Music Clips package. Only the 101 Music Clips Package has the stuff you need to boost your business profits into hyper dive! Now, you can find all sorts of books, articles, and how to guides out there that claim to teach you how to create professional audio. Some of them even have a few ideas that could work in some circumstances (with lack of quality of course). But NONE of them give you the power to present your audio as professional as the 101 Music Clips package does! Can you imagine having pro audio to boost your sales and profits for life without cost? Do you want to be able to call yourself a successful business owner with these increase profits? Can A Regular Joe Like Me Really Create A Hot Audio Product That Truly Sounds Professional? The answer is Yes, No Doubt! You see, most courses or products our there make it sound complicated and difficult to create audio products, but the truth is, it's not complicated or difficult at all...IF, and that's a big IF, you have the audio tracks that the big companies use to create stunning audio! In fact, if you know the simple steps necessary to use these point and click audio tracks, it is downright easy to do. Let me be very clear about this - you won't make huge profits by simply having a website. You will have to follow the secrets that I show you for using professional audio to create stunning audio projects, but I can promise you it's amazingly effective. What Can I Expect When I Get The Music Clips 101 Package? Musician Created Music - The tracks that you are going to get with your Music Clips 101 package are of the highest quality. They are created by a seasoned musician with an ear for musical beauty! Simple To Use Tracks - These tracks are 100 ready to go. You just pick the one that you like the most and then plug it into your selected audio project. This could be your website intro, an audio product or a CD you send out to people! Royalty Free Use - With the Music Clips 101 package, you will never pay a dime in music royalties! You read right! You get to use these tracks (all 100+) any way that you want without ever worrying about paying anything additional! 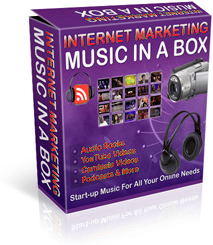 The invaluable power in the Music Clips 101 package is so extensive, powerful and revealing, but still easy to use, that you are going to be totally pumped about wanting start applying these audios in your business immediately!